Hilarious, quick paced and filled with talent. This show was fantastic. In fact, my friend who hates musicals actually said she’d go back the next day! The actors and musicians were so talented. Not only did they improvise the plot, songs and movement on the stage they also had fantastic harmonies, laugh-a-minute jokes and catchy songs. The whole piece felt really well put together despite only just being created. I loved the interaction with the audience and felt this really showed that it was in fact improvised and not pre-planned. Showstopper! has several different actors who perform and we saw Ruth Bratt, Justin Brett, Pippa Evans, Ali James, Sean McCann and Adam Meggido. They were fantastic! Huge talents. Not only could they improvise and make it slick they also had amazing singing voices. Their harmonies and blends of vocals and lyrics would match most musicals. The show starts with the audience creating the setting (country pub), four musicals (My Fair Lady, Rent, Legally Blonde and Matilda) and the name of the musical (the last pint before Christmas). These were intermingled throughout the show. The Rent song, paying homage to One Song Glory was absolutely spot on! Unfortunately the Legally Blonde number fell a bit flat purely because it didn’t sound anything like Legally Blonde. But hey they can’t know everything right? and it certainly didn’t impact the show. Basically if you want a funny, quick-paced show which will make you laugh throughout then this is the show for you! Don’t miss it! Showstopper! 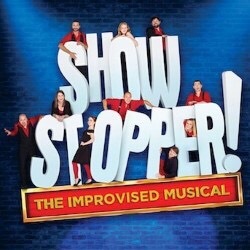 The improvised musical is at Pleasance Courtyard, the Grand in Edinburgh until 27th August.